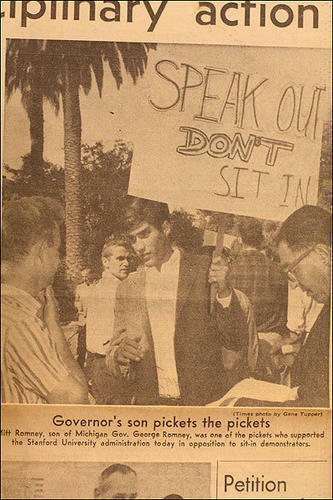 Romney protests FOR the vietnam war, gets 4 deferments from the draft. Discussion in 'Politics & World News' started by TheMontashu, Jul 11, 2012. Other than claiming he'll cut government spending, what has Romney actually said about his policies ? That he's against them now. I'm guessing we'll see this picture a few more times in the next 5 months. just another in a long line of college pranks, that's all. And made $$$ like a BOSS. Mitt strives to achieve such doucheness. Sounds like he showed up for a photo op and then split...even douche-ier. Showing up to have a photo taken and not having the balls to hang around long enough to do any actual work. has he killed anyone with a drone yet? Hasn't had the chance yet, no doubt he would. Especially if he could make a buck off it. rip off your magic underwear & nut up, son! are you talking about Obama? or actually suggesting that Romney is in fact responsible for a company he is the CEO and sole owner of? this is going to be smashmouth politics for the next 4 months, so whitey better buck up. Either way, I get the feeling I can trust Obama...Romney makes me want to count the silverware. Slimey fvck...I will stick with the smart stoner vs. the arrogant child of priviledge. Real talk, on top of the fact that I'm STILL hearing tea tard talk about a birth certificate. Sen. John McCain (R-AZ) defended Mitt Romney from Democratic speculation that he passed on him as a 2008 running mate after reviewing his tax returns, saying Sarah Palin was simply the better choice at the time. Former McCain adviser Steve Schmidt told the Huffington Post this week that the campaign was primarily concerned Romney&#8217;s vast wealth would make the ticket difficult to sell to average Americans, but didn&#8217;t believe Romney&#8217;s taxes were a liability. Schmidt also said he never personally saw 23 years of tax returns Romney provided to McCain during the vetting process. "rich/older & richer/old" as a worse ticket choice is shocking to you? You guys are cracking me up today! Thanks!